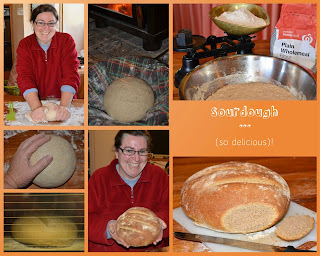 Hamby Home(in)stead ...: Sourdough Success! I finally made my first-ever sourdough loaf yesterday. Vaughan and I started a starter at the end of April and then I started another one about a week later. I've been (mostly) diligently feeding it since, discarding half at each daily feed - and waiting for the right time to start baking. It is fair to say I over-think things and worry too much about doing them properly. The compost bin has done well out of my procrastination - being fed sourdough starter each day. Anyway I gave myself a stern talking-to and decided to actually make sourdough bread - not sourdough compost! Typically, I resolved to start immediately after my pep-talk, which meant my sponge was made at around midnight. I then kneaded the sponge with more flour yesterday morning (at a far more civilised hour). The process of slow-rising took much of the day with the dough just sitting in a covered bowl on the kitchen bench until around 4pm. It was recommended that the second rise take place somewhere draught-free and warm, so my dough was nestled in a cloth-lined bowl by the fire for an hour and a half. By 6pm it was ready for the oven (cranked up to maximum heat of 250 degrees, which was reduced to 200 degrees after the first 15 minutes). The loaf was ready just before 7pm and later served with dinner. A small taste wasn't enough for anybody - so I've started another one today! Last night, Nick congratulated me on my sourdough success and praised my sourdough starter care. He pointed out that I don't have a fabulous reputation as a gardener, tending plants on a regular basis - yet I had managed to keep my starter alive for well over a month. Hooray for me! (His words reminded me of a conversation with my midwife in the early stages of my first pregnancy. She likened ante-natal care to looking after a plant, which she obviously thought was a simple process. I can remember being quite worried about my baby, given the continued death of my houseplants! It was not until a few years later that I confessed to her how much stress her analogy had caused)! CONGRATULATIONS on the first of many Sourdough loaves! It looks very impressive and as there was little left of the first loaf, I suspect it tasted divine too! 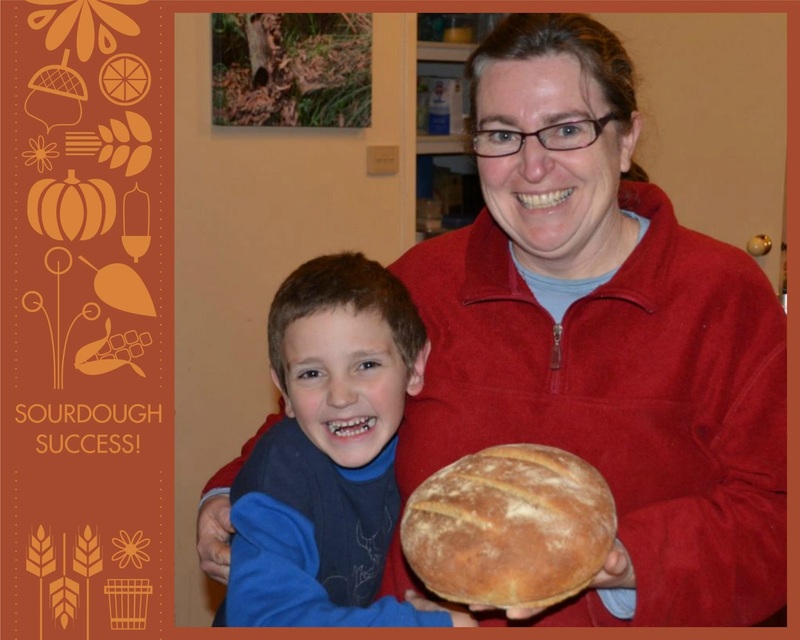 Farmer Hamby kicks another self sufficiency goal! Thanks, Nammo - I was so incredibly chuffed! 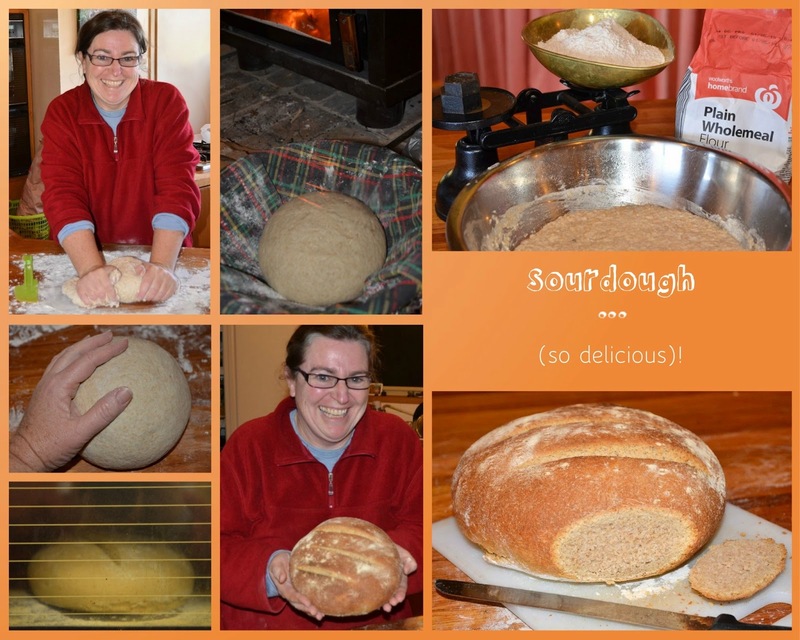 I've made bread before but used dried yeast and the breadmaker (mostly) for kneading - so this involved a lot more of my personal input. I was extremely glad when it worked out even better than expected!